Why do you have it set up so we cannot use all of our fighters? I have all these fighters you will not allow in the battle for some reason. The game works against the attacker taking back his towns or cattle. IT IS FRUSTRATING! During a fight, you get more Battle Points by destroying enemy buildings. Each type of sidekick has a specific 'cost' in Battle Points, 1 for a gunslinger up to 7 for a mercenary. 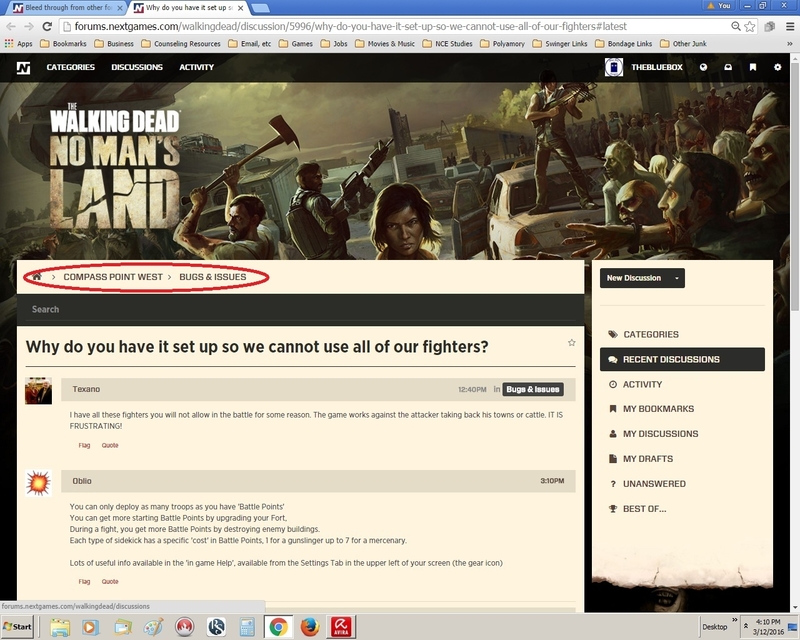 It displays the TWD:NML background. However, the header says "Compass Point West - Bugs & Issues". How strange? Definitely not what it looks like on my screen... Not a zombie in sight anywhere. What? Destroy buildings? Gunslingers? Mercenaries? What game are you talking about? I don't think this is related to TWD:NML as there is no destroying buildings in the Outposts, and there are no survivor classes called Gunslingers nor Mercenaries. Oh, I see. This bled through from another forum somehow. That's odd. I thought the fort was only for defense. Thanks for the info. CPW may add defensive features to the Fort at some time in the future, but for now it is just for managing Rally Flags & Battle Points, and a third yet to be identified element.